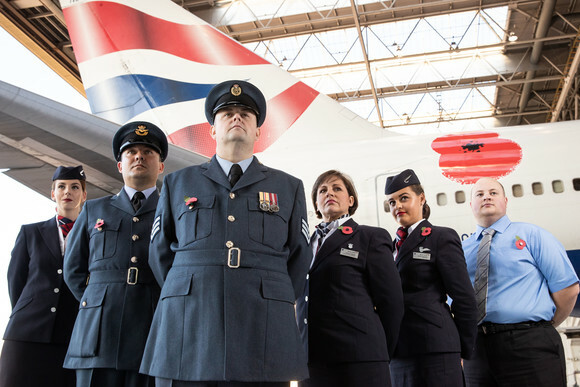 LONDON, UK, 2018-Nov-08 — /Travel PR News/ — British Airways proudly unveils a poppy decal on a Boeing 747 fuselage, as a symbol of remembrance for the fallen. Collections will take place at Heathrow Terminal 3 and 5, at arrivals and departures. On 11th November, at 10.55am, all British Airways staff will pause ground operations and engines will be shut down to observe the two minute silence – where possible. Photo caption: ‘Proudly posing with the airline’s poppy artwork are British Airways’ Poppy Day volunteers: Cabin crew Emily Rowlands, Flight Planner Kai Burman, Customer Services Manager Andrea Popkess, Cabin Mechanic Tom Deary (centre), cabin crew Sophie Fox and Fleet Planning Engineer James Hill’. This entry was posted in Airlines, Travel, Travel Services, Travelers and tagged Alex Cruz, Boeing 747, British Airways, poppy decal, Tom Deary. Bookmark the permalink.